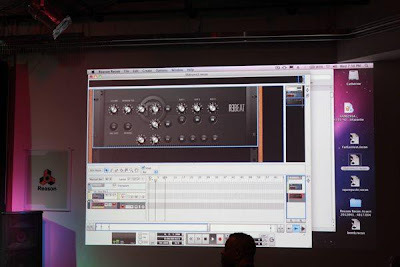 Peff demonstrated his new "R3bEAT" device last night in San Francisco at the Elite Session with Propellerheads Reason Software at Pyramind Studios. No real descriptions so far of what the coming Rack Extensions device does... but, I'm thinking a Beat Repeater of sorts? "R3bEAT is a working title. We need to find a name that is less likely to infringe on existing trademarks." UPDATE: According to ZionAural on the PUF, R3bEAT is "based on buffer playback" with "different playback modes, including LIVE REVERSE!" 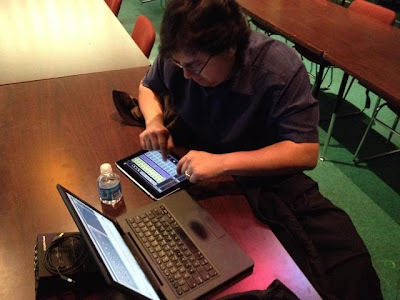 Evidently the Rack Extensions device will come with a Lemur template for those of you lucky enough to own an iPad ;-). How to build a guitar amp combinator in Reason! Figure - Now available in the Apple app store!